Last week, we talked about what it means to not fret but to trust. This week, I want us to look at the word dwell and consider how we can apply this into our everyday life. I like to read different Bible translations when I am studying a passage. God is calling each of us to not only live and dwell in the day to day moments He has placed us in, but to live each day in a way in which we cultivate faithfulness. The word faithfulness means to be loyal to, constant or steadfast. We are to be loyal – constant – steadfast to the circumstances that God has us in. Rather than worrying, complaining, or placing our entire focus on wishing we didn’t have to face this situation, we need to simply trust God for it and loyaly embrace what He has allowed. We need to ask Him to give us strength to be faithful to live right where He has placed us. 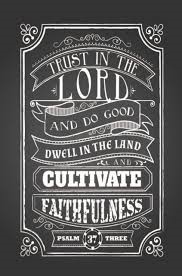 We need to cultivate faithfulness by steadfastly enduring our circumstance, until God leads us out of it. As you faithfully endure, He is not only working out His plans for you, but He is also cultivating your heart to look more like His. He passionately loves to create these characteristics in your heart that honors His name – love, joy peace, patience, kindness, goodness, faithfulness, gentleness and self-control (Galatians 5:22). If you allow God to cultivate faithfulness in you, as you go through difficult times,these attributes will be readily seen in your words and actions. Am I choosing to worry, complain and doubt God, or am I choosing to fully and joyfully surrender to living and dwelling in the provisions or circumstances that God has me in right now? Am I choosing to cultivate faithfulness in my relationship with Christ? Am I daily reading His Word, talking to Him, listening to what He has to say to me and then obediently following Him? What fruitful characteristics are seen in my life (see Galatians 5:22)? What does God need to cultivate in me? To live in the provision that God has given to you at this present time..I am very restless and hibernation period too long..ready for spring..happens every year. These words help me to look around and take stock in God’s faithfulness to me and my family.